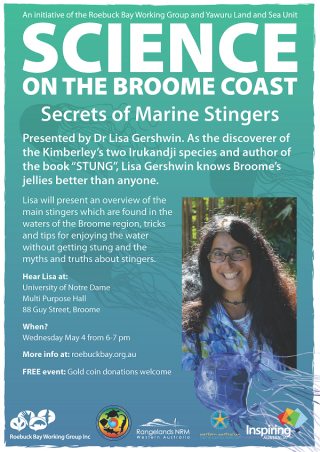 Secrets of marine stingers Notre Dame Multipurpose Hall, Wednesday, May 4 at 6pm. 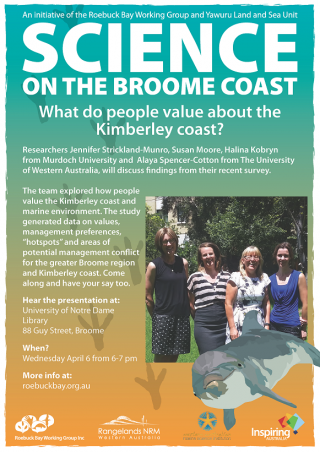 The beautiful Kimberley coast is the topic for the first Science on Broome Coast presentation for 2016 – Wednesday April 6. This presentation will be provided by an outstanding team of scientists, at The University of Notre Dame’s Graduation Square at 6pm. The Science on Broome Coast series is sponsored by Inspiring Australia, Yawuru Land and Sea Unit, Western Australia Marine Science Institution, The University of Notre Dame Broome, Department of Parks and Wildlife and Rangelands NRM. Science on the Broome Coast is put on by Roebuck Bay Working Group and the Yawuru Land and Sea Unit.